The Indian Printing Packaging & Allied Machinery Manufacturers’ Association (IPAMA), which is organizing PrintPack India 2019 (14th edition) at India Expo Centre, Greater Noida from February 01-06, 2019, has already sold out more than 60 percent exhibition space to 233 exhibitors (Till 17th Feb 2018). As per the existing policy of IPAMA management, the participants are being issued Priority Number on receipt of the application along with the requisite amount of space rent. The priority number is generated within 48 hours of the credit of the requisite amount in IPAMA’s Bank account. To make the participation hassle free, the space will be allotted to the exhibitors strictly in accordance with the priority number. This information has already been circulated to participants, through various channels, for their information and guidance. The prominent companies amongst those who have already booked their space for participation include LineOMatic, HP, Provin Technos (Ryobi), Megabound, Xerox India Ltd., Manugraph India Ltd., Insight Communication (Komori), Technova, Kodak India, Prakash Offset, Memory Repro, Alpna Visual, Electro Mec, Bobst, Monotech, Malhotra Graphics, Excel Machinery, NBG Printographics, Ronald Web, Manroland etc. Many more big companies, including Konica Minolta, The Printers House, Canon, Zhongke India and Muller Martini are in the pipe-line. LineOMatic is leading as far as space booking is concerned. It has booked 500 square meters of space. The companies booking space on or before 31st March, 2018 will get a discount of Rs.500/- per square meter. The new companies enrolling as IPAMA Members will also get further discount of 5%. NSIC members can submit their applications for availing MSME assistance through them. IPAMA intends to provide world-class exhibition facilities to visitors and exhibitors. A multi-purpose website, relating to PrintPack India 2019 exhibition is being developed. All the relevant information which will be incorporated therein can be shared by the visitors and the exhibitors. The industry associations, which are interested in organizing seminars, conferences, business-meets etc. during the exhibition, in association with IPAMA, can submit their proposals for consideration and approval. 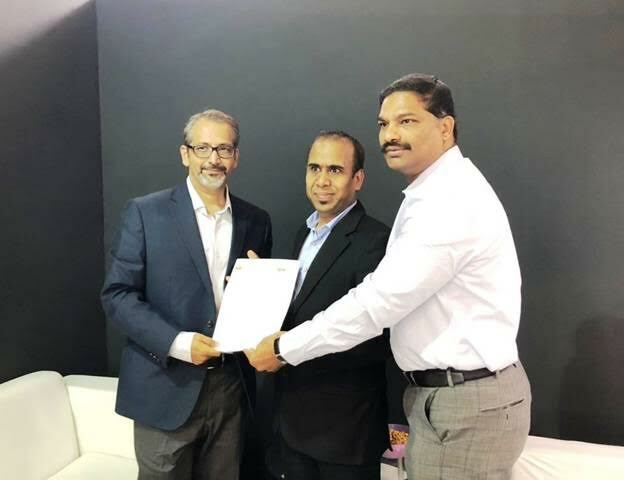 IPAMA has also signed one more MOU with Indian Paper Corrugated & Packaging Machinery Manufacturers’ Association (ICPMA) for marketing & sales of the space earmarked for “Corrugation Industry” directly and or through sub-agents; dissemination of information of PRINTPACK INDIA 2019 through website, monthly newsletters and bulletins to their members and potential exhibitors. ICPMA will also be branded as “Corrugation Industry Partner” for promotion of the Show. Before ICPMA, IPAMA had signed agreements with (1) Association of Label Printers & Suppliers (ALPS); (2) Indian Paper Corrugated & Packaging Machinery Manufacturers’ Association (ICPMA); (3) Screen Printers’ Association of India (SPAI). In continuation to the agreements with different Indian Associations of Graphic Arts Industry, IPAMA is now heading towards SAARC countries, and also signed its first MoU with Bangladesh Mudran Shilpa Samity. The financial sector of Bangladesh is the second largest in the subcontinent and a growing market. Association is also approaching Sri Lanka and Bhutan in its second phase. As a part of promotional activates, IPAMA has already organized two promotional Meets, one in Mumbai and the other one in Amritsar. IPAMA has also marked its presence in domestic exhibitions, including those organized at Kolkata, Vijayawada, Ahmedabad, Chennai etc. In the past IPAMA had also marked its presence in many foreign exhibitions for promoting PPI 2019. It is also participating in Collate 2018 being organized by Sri Lanka Printers Association at Colombo in March, 2018. Related information will be uploaded on IPAMA’s web-site for information of visitors, exhibitors and concerned organizations. We are sure that this exhibition is going to set a benchmark.